How do you use Ebixa? Ebixa is an anti-dementia medicine. The active substance Memantine belongs to the so-called NMDA blockers: drugs that improve the transmission of nerve signals and help protect the memory function. Ebixa can be ordered online at the pharmacies working together with Dokteronline.com. The required prescription is provided through an online consultation. 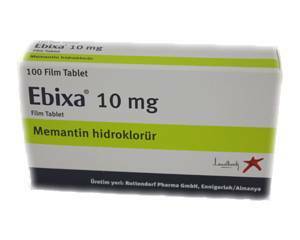 Doctors prescribe Ebixa against moderate to severe forms of dementia, for example in Alzheimer’s disease. Dementia causes for a lot of brain functions to deteriorate. Especially the memory is affected, causing the patient to forget many things such as orientation and the sense of time. Eventually the patient will not be able to care for himself anymore. Ebixa protects the receptors in the brain that are involved in the functioning of the memory. This improves the signal transmission in the brain and memory becomes stronger. Ebixa should always be taken around a fixed time of the day. Swallow the tablet without chewing with some water. To avoid side effects as much as possible, the dosage of Ebixa is gradually built. You can do this by halving the tablets at the start of the treatment. However, the pharmacies working together with Dokteronline.com also offer a starter package online. This Ebixa Treatment Inition Pack contains tablets in four different dosages, which allows you to easily build up the treatment. Week 1: once a day half a 10 mg tablet (5 mg). Week 2: once a day 1 10 mg tablet. Week 3: once a day 1.5 10 mg tablets (15 mg). Week 4: once a day 2 10 mg tablets (20 mg). After the build-up phase, the recommended dosage stays of 2 10mg tablets once a day. Read the instructions before use. Contact a physician if you suffer a lot from these or other side effects. In the leaflet you will find a list of all possible side effects. are hypersensitive to Memantine or any of the excipients used. Talk with the doctor about the use of Ebixa if you have high blood pressure that is not under control, if you suffer from epilepsy or if you have heart- or kidney problems. If you have any other health problems or if you take other medicines, a doctor will know if you can use Ebixa safely. You will find more information about the contraindications and other warnings in the leaflet. Do not take this medicine when you are pregnant, planning on getting pregnant or if you breastfeed. Ebixa can cause dizziness and drowsiness. Do not participate in traffic if you suffer from such side effects. There is no warning for this medication in relation to the use of alcohol.